Just in case there was any confusion from that last blog post, it was, in fact, an April Fool's prank. 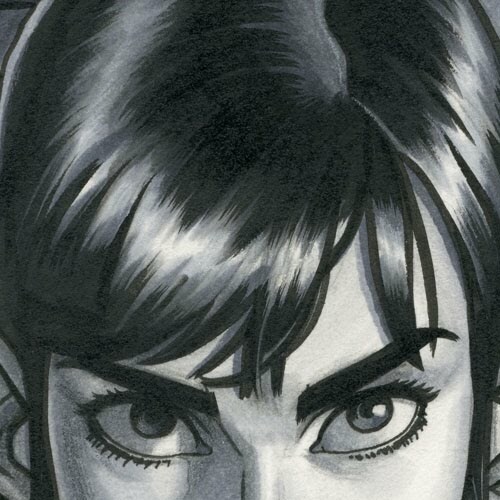 Though I'd certainly love to be, Paolo and I are not slated to collaborate on any comic projects for the time being. The "reference" pictures I'd posted were actually elaborate costumes Paolo and I and a group of friends had made for a costume ball held at our college back in 2003. 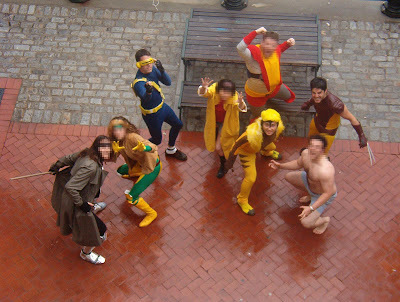 We and some friends convinced a broad cross-section of art students from our school to dress as characters from the X-Men for the event. Above is a group photo of most of us in our super nerdy duds. At the time, we thought we'd eventually make a photo comic of each other in superhero dress to commemorate the event (it never happened), hence this very posed and dramatic photo. *Faces are blurred in the above photo on account of my not having gone through the trouble of getting the permission of those photographed to post their visages on the interwebs for all to see. I'm sure they wouldn't have minded, but I'm being nice. Cyclops' shoes and socks crack me up. Holy Craptopolis of Neverland...I can't say I forgot (how can you), but it certainly is fun to be reminded of that. Those were awesome costumes and fun times! I wouldn't have minded... You should've photoshopped me blue, though. There, I just look like the weird naked guy. Miss you, joe. Maris, too. So the weird naked guy was Iceman? Beast?